By Tracy Mills. I have compiled this file for use in Genealogy Research. There are many websites out there that offer different types of charts for use in genealogy research, but in my opinion they either don't cover enough information or don't provide you with enough space to write the kind of things that you are looking for specifically within your family. I've created this one so that it can be easily modified to suit any level of genealogists from basic beginners to expert professionals. 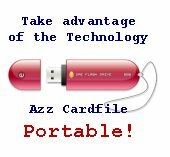 I chose this program because of it's versitility and ability to include picture/graphic files along with text files, and also to allow cards to be printed and/or exported. For a genealogist this can be imparative. 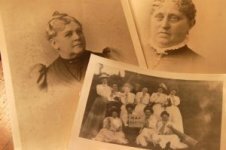 This way you can include photos of family members right in the card for that family group or you could scan your documentation (death certificates, obituaries, land records etc.) and place them on the card for the family group that they pertain to. I love using this software. It is great for so many other things. In addition to this genealogy file that I've created I use the software as an Address Book (both e-mail and phone), a Music Catalog, a Recipe/Cookbook, and an Inventory Keeper for my craft supplies. I hope that you will find it as useful as I have.